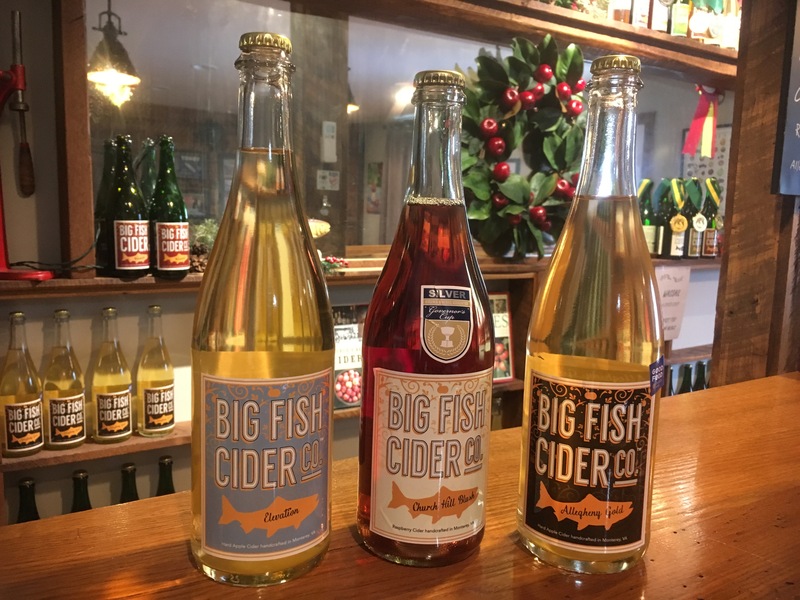 Cider Club - Big Fish Cider Co.
As a member, you will receive quarterly shipments (or you can visit us in Monterey for pickup) of 3 bottles of cider. The list will be emailed out prior to shipment. As a member you will receive a 10% discount on your purchases, allocations of limited release ciders, and invitations to special events at the Cidery. Cider club memberships also make great gifts! Cider: Quarterly (March, June, September, December) you will receive 3 bottles, 1 each of 3 great ciders. Total cost of each shipment will range between $45 and $50, plus shipping. You can opt to visit us in Monterey for pickup to save on shipping costs. Substitutions are allowed. Discounts: You receive an unlimited 10% discount on all of your purchases made online and in the tasting room. You will receive a 10% discount on the cost of the cider in your quarterly shipment as well. Tastings: In each shipment, you will receive a punch-card redeemable for 4 free tastings or glasses of draft cider to use during that quarter. Additionally, if you choose to come to the Cidery to pick up your cider, where will be complimentary tastings of the three ciders in the current shipment. Events: Receive invitations to special events such as tank tastings. For events that are open to the general public, tickets will be available at the Cider Club Member pricing. These events include our annual Wassail ceremony in January, cider and cheese pairings, and classes. Rules: Member must be 21 or older. Shipments can only be made to the following states: AK, AZ, CO, DC, FL, GA, HI, IA, ID, IN, KS, LA, MA, MD, ME, MN, MO, NC, ND, NE, NH, NM, NV, NY, OH, OR, PA, SC, TN, TX, VA, VT, WA, WI, WV, WY. We keep your billing information on file and notify you via email in advance of the quarterly shipments. You may change your preference for pickup or delivery in advance of quarterly shipments. Cancellation of more than one quarterly shipment per year will result in cancellation of membership and nullification of membership benefits. Now Shipping to Customers in over 30 states!